She was “Professor Arguello” more than 18 years ago when I first met Judge Christine Arguello as a 3L at the University of Colorado Law School. She became and remains an inspiration. From her early upbringing to her famed legal career to her never-ending energy to help the next generation of attorneys, Judge Arguello’s story is the quintessential “American dream.” You are in for a treat. HARDY: Judge Arguello, could we start out by you telling us about your personal background? ARGUELLO: I’m a Colorado native. I was born at home in a little town called Thatcher. My dad worked for the railroad, and Thatcher, which is out in the middle of nowhere between La Junta and Trinidad, was a railroad refueling stop. We moved to Pueblo when I was in first grade so my dad could attend barber school. When I was in fourth grade we moved to Buena Vista so he could open a barber shop. We stayed until right before my senior year. It was a wonderful place to grow up, but we were only the second Hispanic family to move there. Despite its name Buena Vista it was not very integrated and that was difficult. HARDY: When did you know you wanted to be a lawyer? ARGUELLO: I was 13 years old when this most pivotal moment in my life took place. As I waited for my best friend, I happened to pick up a news magazine. Leafing through it, I found an article on lawyers and law schools. The text conveyed the sheer power that lawyers exercised in accomplishing societal change and the protection of individual rights. I had never met a lawyer so, until I read that article, it had never occurred to me that I could become a lawyer and change the world. I thought, “Lawyers like to argue with people. I like to argue with people. And I usually win my arguments. So, I would be a good lawyer.” The article went on to talk about law schools and what I remember it said was that Harvard was the best. I had no idea where Harvard was, but I said that’s what I wanted for myself — the best. HARDY: What challenges did you face out of law school? ARGUELLO: I wanted to be a trial lawyer and I fully intended to return home to Colorado. Unfortunately the law firms I interviewed with at Harvard kept trying to steer me toward becoming a transactional attorney or an estates attorney. I believe it was because there were very few female trial attorneys back then, and there were no Latina trial lawyers here in Colorado in the late 1970s. I didn’t fit their stereotype of a trial attorney — white male, six-foot tall, imposing in the courtroom, big mean voice. I was a 5’1” Latina who looked to be 16 years old. I decided that if I wanted to be a trial lawyer, I was going to have to take control of my own destiny My husband and I moved to Miami and I started with a firm where I was the only Spanish-speaking litigator and got some really great cases. They took me under their wing and polished this “diamond in the rough.” I credit them for making me the lawyer that I became and the judge that I am now. HARDY: Tell us a little about your professional background. You touched on it, but can you tell us how you got to become a federal judge? ARGUELLO: When I moved back to Colorado and joined Holland & Hart, my goal was to make partner. Once I made partner, I realized several things. First, I wasn’t able to do the research and writing I loved, because my billing rate was too high. Second, I no longer had a goal to strive toward. Most important, I had a five year-old and a one year-old and I wasn’t spending the time that I wanted to spend with my family. I decided to take on a totally different challenge and joined the faculty at the University of Kansas School of Law so I could continue researching and writing, while also mentoring the next generation of lawyers. When we returned to Colorado in 1999, Ken Salazar, who had been elected Attorney General, called and invited me to join his cabinet. I was able to work out a schedule that allowed me to teach bankruptcy law at CU while also working for the AG’s office. Working as Chief Deputy for Ken Salazar was the best decision I ever made. Ken is an incredible man from whom I learned so much. The work we did on behalf of the people of Colorado was both challenging and so personally gratifying. And, honestly, I wouldn’t be sitting here talking to you as a federal judge if I had not gone to work for Ken. HARDY: What perspective do you have as a longtime judge that you may not have had as a practitioner? ARGUELLO: One of my frustrations when I was a practitioner was that I would submit a motion to dismiss and it would take a year or two years to get it ruled on. So, I wondered, what are those judges doing over there? In the meantime, either discovery was stayed and memories were fading, or your client is racking up fees for discovery that you won’t need if the dispositive motion is granted. I’ve found out that the case load in the federal court is quite burdensome, so while there are delays, it is not because the judges are not working hard. HARDY: Is there an over-arching philosophy that you developed over your nine years on the bench? ARGUELLO: It is the philosophy I always held in both my personal and professional life — do unto others as you would have them do unto you. I believe that there is nobody in your life that you cross paths with that is not a very important person. As a judge, I want to make sure that the litigants feel welcome in my courtroom and I invite lawyers back to chambers after their first appearance before me. I want them to see me as a person. I tell them I only have two rules in my courtroom. One is that they will treat each other and me and everybody else in this courtroom with respect. And I, in turn, will always treat them with respect. The second rule is that they are never to come into my courtroom unprepared on their case and I will never go into their case unprepared in my courtroom. HARDY: Your Honor, you have had many firsts — the first Latina from Colorado to be accepted to Harvard Law School and the first Latina to serve as a federal judge in this district —do you see yourself as a trailblazer and, if so, do you consider that a responsibility? ARGUELLO: I do see myself as a trailblazer, but only because I’m so old (smile). Yes, I do think being the first results in a responsibility and an additional burden one has to carry, especially if you are a person of color. When you are the first, you are setting the standard for the next Latino/a student/judge. I also think I have a responsibility to make sure that, although I may have been the first, I will not be the last. I now need to open doors and help others to reach the same peaks I have. HARDY: You’re one of the most generous people with your time and energy that I have encountered, particularly with young people. Where does that come from? ARGUELLO: I realize that I didn’t get to where I am today all on my own. I believe in paying it forward. Plus, I’m an extrovert and I love mentoring young people because I think it is really important to give guidance where it’s needed. HARDY: What is Arguello Dream Catchers Law School… Yes We Can? ARGUELLO: Law School…Yes We Can is a program that was put together by Roberto Ramirez, Dermott Lynch, Aria Vaughan, Mark Yonkman, and me in 2014, to advance inclusiveness in the legal profession. 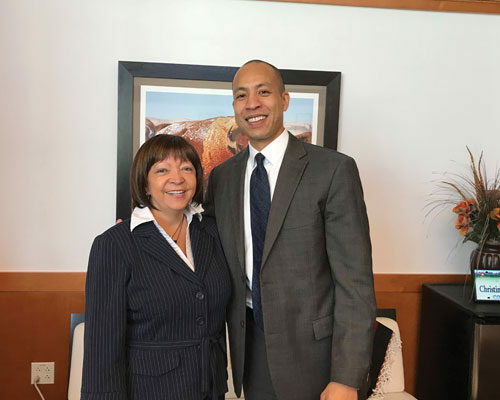 Our goal is to equip Colorado high school graduates from diverse backgrounds with the knowledge and contacts they need to become highly qualified applicants for admission to the nation’s best law schools. Each year we admit 15 Colorado high school graduates to the program and we pair them with three mentors — two lawyers and one law student — who will mentor these students through their entire four years of college. We supplement the mentoring with bi-monthly workshops and exposure programs to develop both soft and hard skills. Although we have more than 150 lawyers/law students involved with the program, we will be looking for 45 new mentors for the Class of 2018. I would encourage anyone who is interested to go to our website, Lawschoolyeswecan.org. HARDY: Do you believe that we as a Colorado legal community have made progress in diversity and inclusion? ARGUELLO: I think we’ve made progress, definitely. Programs like the Pledge to Diversity, Diversity in the Legal Profession, and the Center for Legal Inclusiveness make me proud to say I am a lawyer in Colorado. But, there is more to be done. HARDY: What advice would you give to a new attorney? ARGUELLO: There are a number of things I would tell them. Don’t take a job just for the paycheck. You want to be able to love the work you do because you’re going to work long and hard hours as an attorney. When you roll out of bed every morning you should be excited to go to work. When you end up at the point that you’re not excited to go to work anymore, it’s time to make a change and not be afraid of that change. Change is what makes you grow. The second piece of advice is to take control of your own destiny and not let anyone control your career. Third, never let the “golden handcuffs” bind you. Many of the jobs I took after I left Holland & Hart involved significant pay cuts, but I was willing to sacrifice income if it meant an interesting and challenging job. As a result, I’ve had a fabulous career. I am a better judge because I had such a varied legal career and am able to bring so many different perspectives to my role. HARDY: What advice would you give to an established attorney? ARGUELLO: I think that the key to anything is living by the Golden Rule: do unto others as you would have them do unto you. Your most valuable possession as a lawyer is your reputation. When I was undergoing the FBI background check before my nomination, a friend told me that one of the agents commented, “Is this woman for real? We can’t find anybody who will say anything negative about her.” So, being a zealous advocate on behalf of your client does not mean you need to be nasty and overbearing. HARDY: When we first met in 1999, you were a lawyer and an adjunct professor at CU Law School, and I was one of your students. Who would have thought that we’d be sitting here today, 18 years later, in your courtroom chambers having this interview for the DBA. Is there a broader lesson for us to take away from where we first met to where we are today? ARGUELLO: I think that despite the fact that there are thousands of lawyers in Colorado, it’s a very small legal community. You and I have crossed paths so many times because you’re always giving to the community as well. The broader lesson is that, as a lawyer, you are going to cross paths with many people, which brings us back to the Golden Rule. HARDY: Is there anything else that you wish to tell the Denver legal community? ARGUELLO: Well, I think that one of the other messages I’d like to pass on to especially the younger generation of lawyers is that you don’t achieve success all by yourself. The local bar associations are so important to your future potential and your growth. They provide you with a community of other lawyers that you can share and interact with. They are there to support you when you want to aspire to do something like become a judge or open up a new non-profit, or whatever other goal you have in mind. So I would encourage young people to get involved with the DBA, the Women’s Bar, the other affinity bars, the CBA. That’s your community. Collaborative Divorce: What in the World is Collaborative Divorce?